Today’s post is the fourth in a series about my visit to Stonebriar Community Church’s Special Needs Ministry in Frisco, Texas. Meaghan Wall, the Special Needs Ministry Coordinator for Stonebriar, was kind enough to provide a tour of the church’s special needs suite. 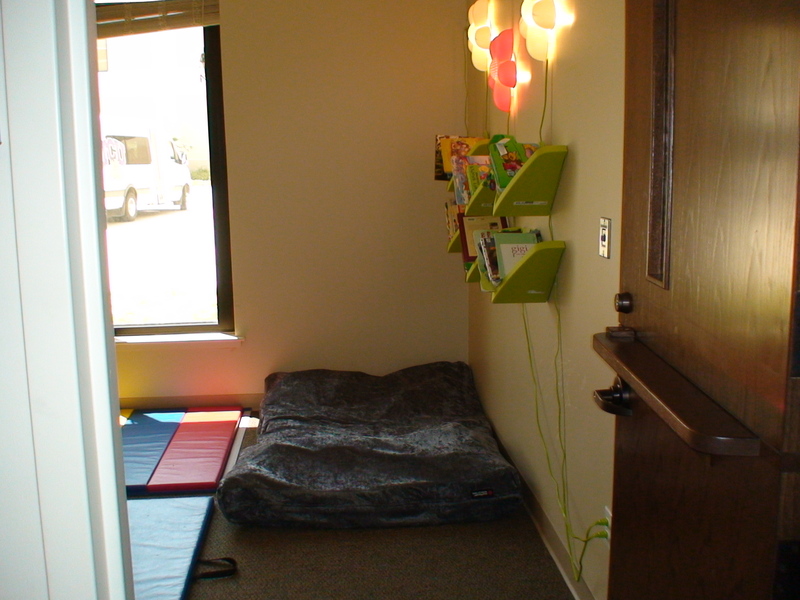 In today’s post we’ll talk about the quiet room inside the special needs ministry suite. 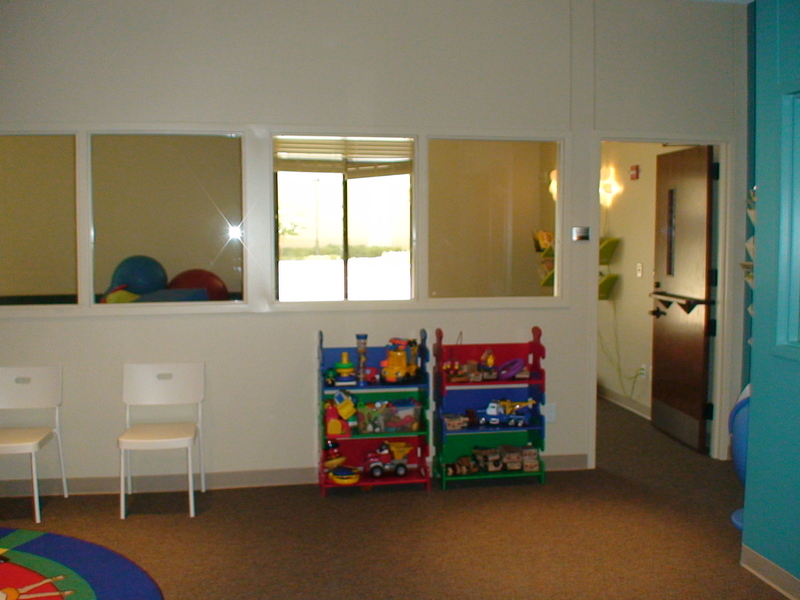 The above picture is taken from inside the special needs ministry suite, standing in the main classroom. The room behind the door and two windows on the right is the “Quiet Room”. While a church may not have the space or funds to add a specially designated quiet room, it is important to have a quiet or “chillax” area inside the children’s ministry environment. This may be a designated area inside a larger classroom or at the end of a quiet hallway. Students with special needs often have sensitivity to noise or even visual stimulation. By its nature, every children’s ministry environment is going to feel chaotic at some point. For a child who may become rattled by the increased activity level, providing them a “take a break” area free of visual and auditory distraction can be helpful. Similarly, some children may also struggle with self-regulation. This is a common characteristic of a child with sensory integration disorder, sensory processing dysfunction, autism, ADHD, and a host of other special needs diagnoses. When a child begins to appear aggitated or less cooperative, he or she may be communicating their need calm down and even rest. So often a child who is “misbehaving” is actually giving a signal that he or she needs a break from the noisier, busier environment. When allowed a few moments to recharge in the quieter area, the less cooperative or even disruptive behavior often disappears. After a short period recollecting in the quiet space a child may be ready re-enter the larger group setting. 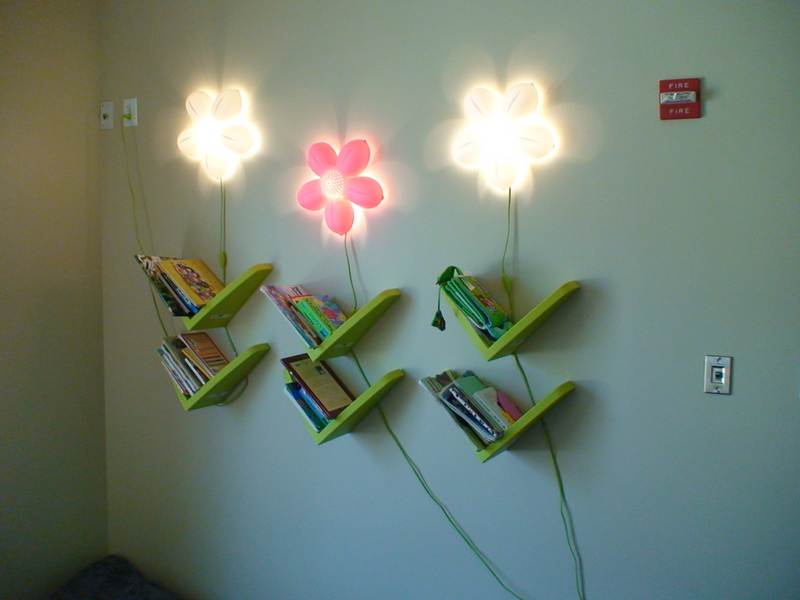 The lights and wall bookshelves shown were purchased from IKEA. The above picture shows a “pillow” the approximate size of a double mattress. This landing spot has soft chunks of foam of different shapes and sizes inside two mattress covers (one is vinyl) and a soft, plush velour outer covering. This product shown is manufactured by SouthPaw Enterprises. This picture shows the evacuation crib. In case of emergency, this rolling crib can hold several children at once and fit through all doorways to quickly exit a building. 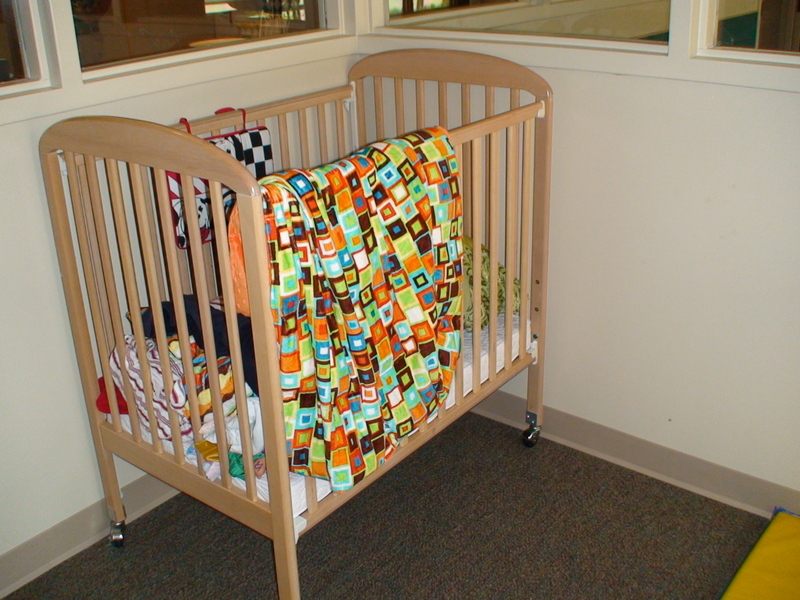 Stonebriar keeps the crib in the quiet room, in plain view and easy access for to the workers. The crib also holds a number of soft toys and sensory aids. In this picture you see a weighted blanket draped over the side of the crib. Meghan shared that the weighted blanket is one of the most frequently used tools/toys among the students. The picture below shows the tag on one of the weighted blankets in the room (weighted blankets and lap pads can be purchased from Grandpa’s Garden). 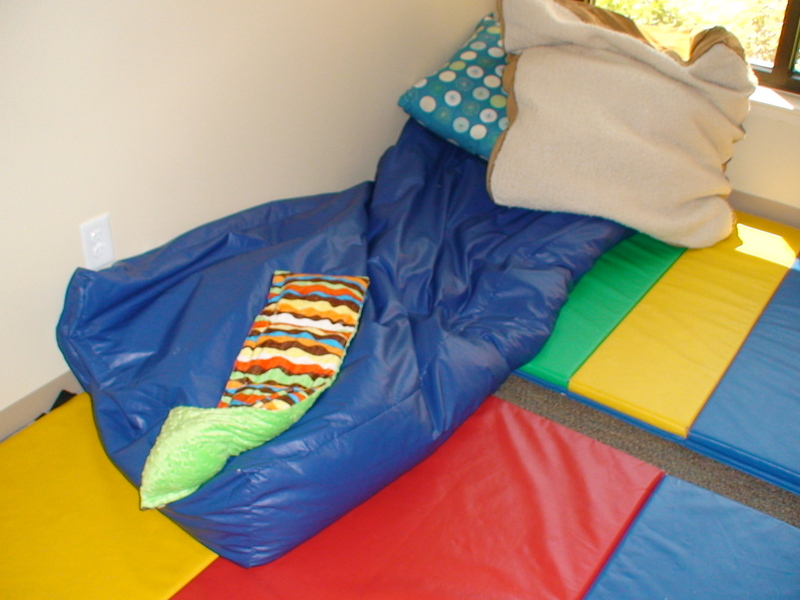 The above picture shows activity mats, a large oblong beanbag (covered in an easy-to-clean vinyl), pet pillows, and a weighted lap blanket. 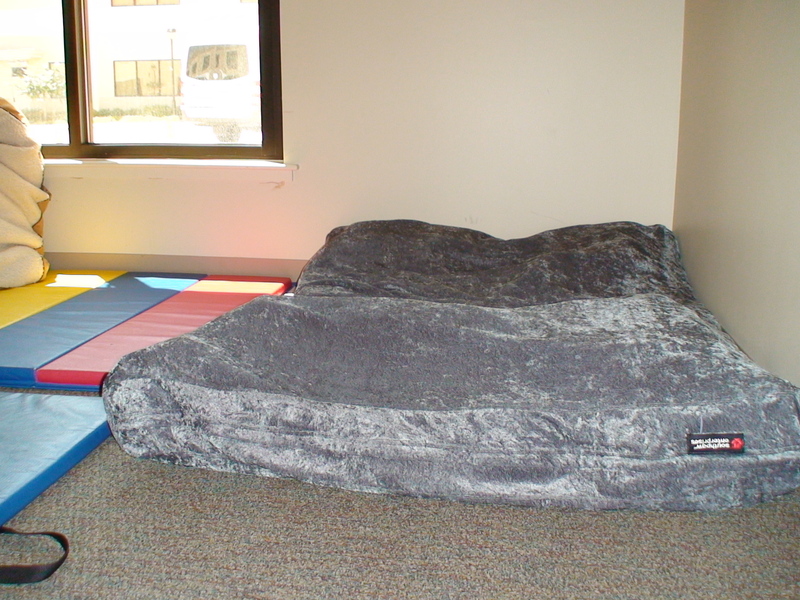 While I was visiting last Sunday a worker ran into the quiet room and grabbed the weighted lap blanket shown here to place on a child in the main classroom. The child was beginning to get restless and loved having the weighted lap blanket draped across her legs. 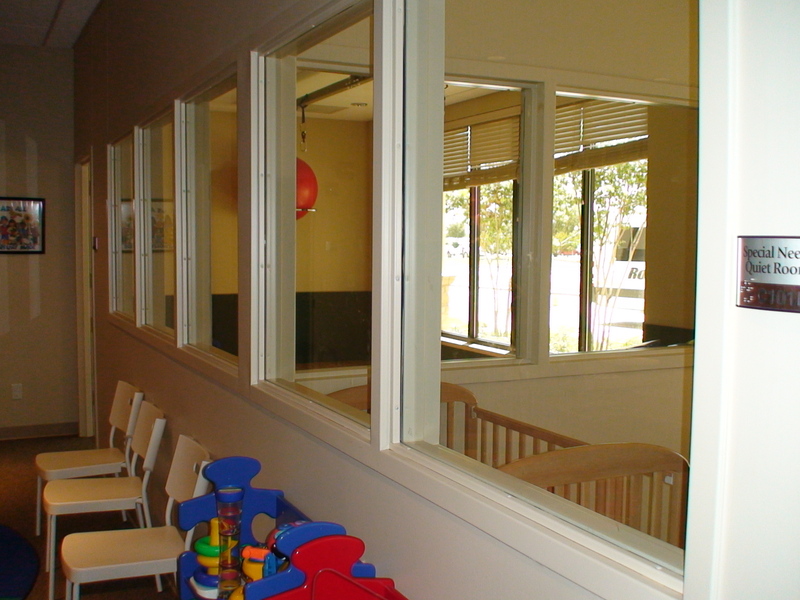 Providing windows inside the space is extremely important for safety reasons. This allows a child to be inside any of these environments with one adult as long as the child and the worker are in plain view of a second adult caregiver at all times. (Note: for the purpose of the 2-person rule, at least two unmarried adults-caregivers should be present and working in view of each other at all times). Inside windows can help prevent the practice or perception of abuse in children’s ministry environments. The immediate right windows look into the quiet room (where you see the evacuation crib). The room in the far right is the sensory/play room. We’ll talk about this room in the next post. What ideas do you have? Does your church have a quiet space…perhaps with a beanbag or small tent? Share your best practices with the readers. I am so enjoying seeing all these photos. I LOVE that velour mattress–brilliant! love it!! My son has a “calming cave” in his classroom at school, it is just a small spot near the teachers desk and has his blanket and pillow. He goes there any time he needs to settle. We also LOVE our weighted blanket. My mother-in-law very graciously made one for us and it is brilliant. My son uses it all the time. We are hoping to get him a weighted lap one for school this year. I just love this whole set up! !